When you’re out camping on a hot summer day, you’ll be glad to have a portable cooler to keep your food and drinks cold. We shopped around and found the best coolers to either fill with ice or plug into your vehicle’s 12-volt outlet. 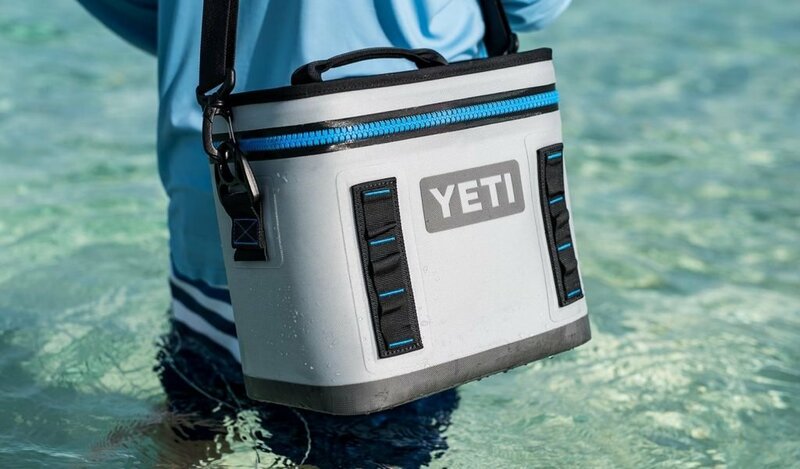 The Roadie is the smallest cooler in YETI’s popular Tundra line. You can hold up to fourteen 12-ounce cans in this heavy-duty cooler with ice (they recommend a 2:1 ice-to-contents ratio). 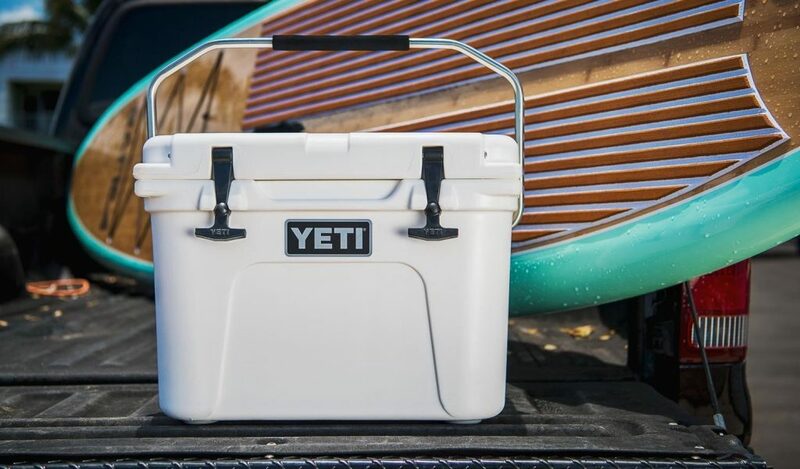 YETI’s soft-sided coolers are more lightweight and portable. Their Hopper Two holds up to six cans with ice and is designed with a tough fabric and zipper that are both water and leakproof. Coleman’s steel-belted cooler has a simple retro design that will take you back to the 1950s. This 54-quart cooler holds up to 85 cans and has its own built-in bottle opener on the side. The insulation keeps ice for about four days in temperatures up to 90 degrees F.
If you don’t want to worry about the hassle of buying ice or just want more room for food and drinks, you might prefer a thermoelectric cooler like the Powerchill from Coleman ($79). It simply plugs into your vehicle’s 12-volt outlet to keep the contents cold. 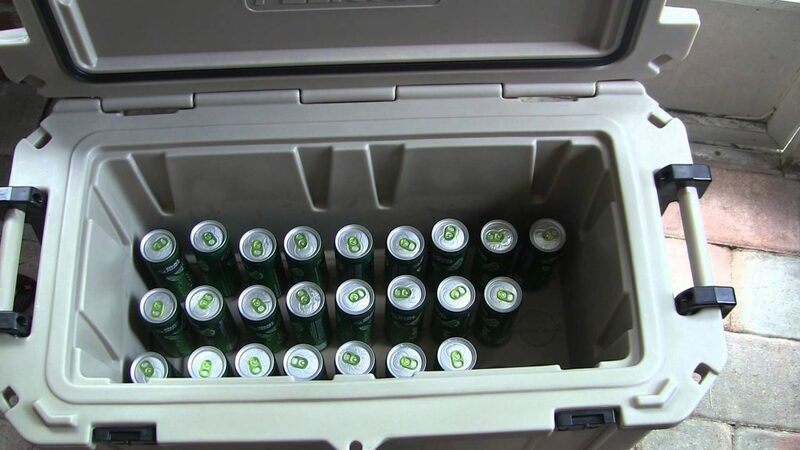 The cooler can stand up like a mini fridge and has a tray shelf to keep everything nice and organized. At 40 quarts large, the Powerchill can store about 44 cans along with some small snacks. 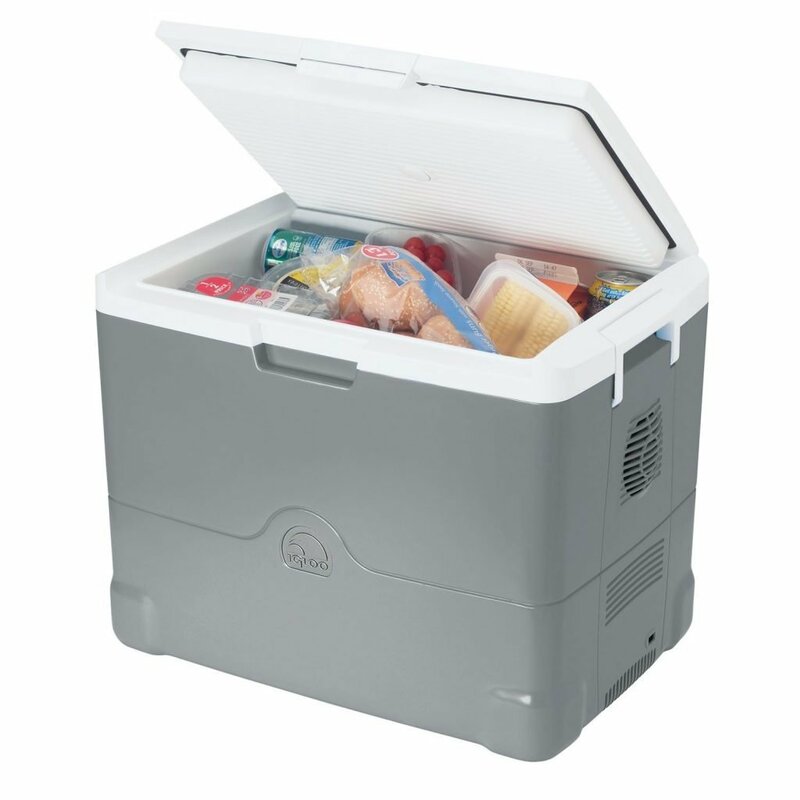 Coleman also makes a 40-quart Hot/Cold PowerChill that doubles as a cooler and a food warmer. Wheeled coolers, much like suitcases, are easier to transport no matter how much you load in them. 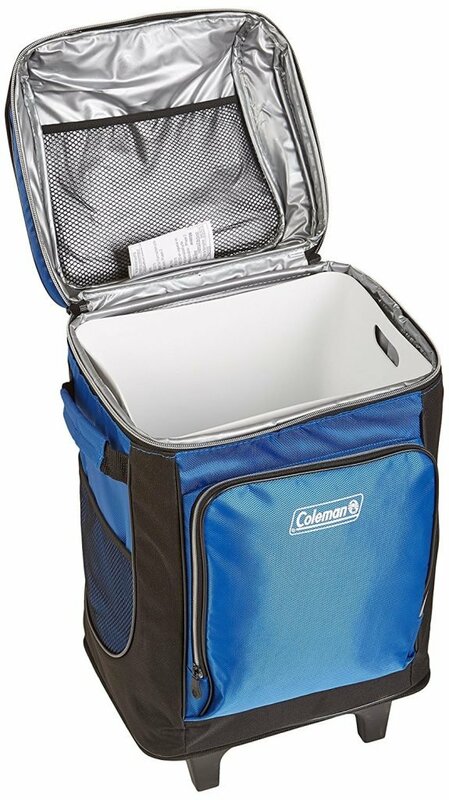 This Wheeled Cooler from Coleman holds up to 42 cans and has a telescoping handle that can be pulled effortlessly. 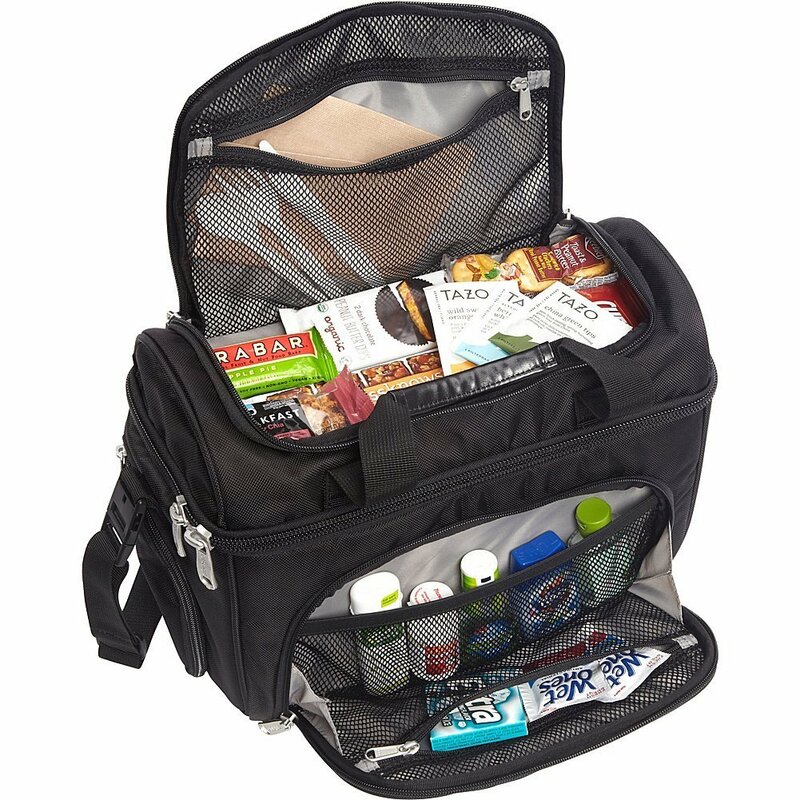 You can also store small snacks in the cooler’s front zippered pocket, side mesh pockets, mesh pocket on the top inside, and under the bungees on the lid. 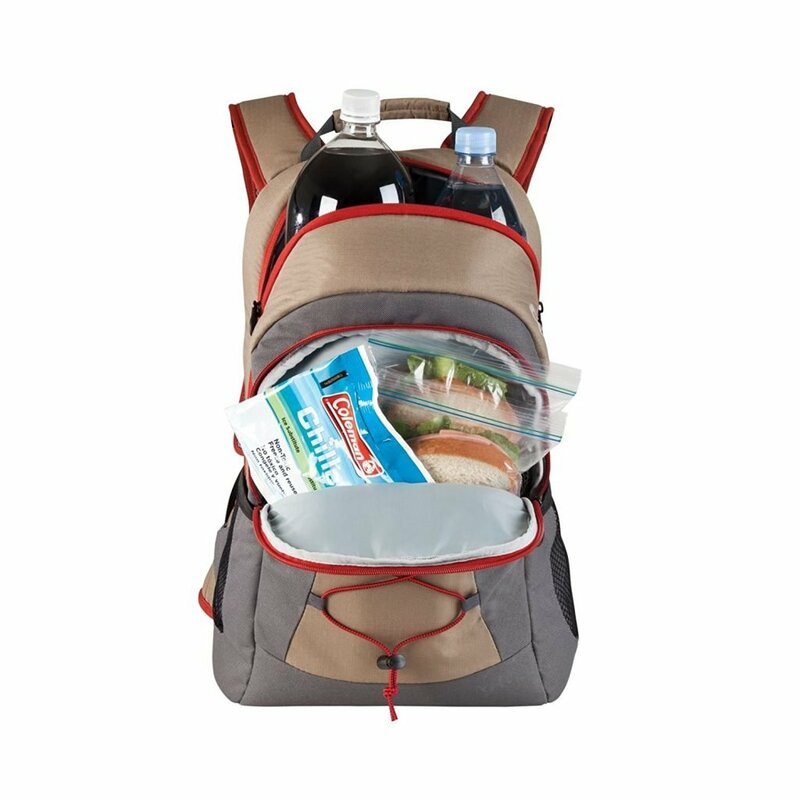 A backpack cooler can be useful if you’re going hiking or on a day trip and want to save money by bringing your own food. The Backpack Cooler looks and feels like a real backpack and keeps up to 28 cans well-insulated. It’s designed with padded shoulder straps and straps that go around your waist to evenly distribute the weight. You can plug this dual cooler/warmer from Wagan ($75) into any 12-volt outlet to keep drinks cold or to warm up food. It has enough room to hold four 2-liters, a couple of wine bottles, or 27 cans. 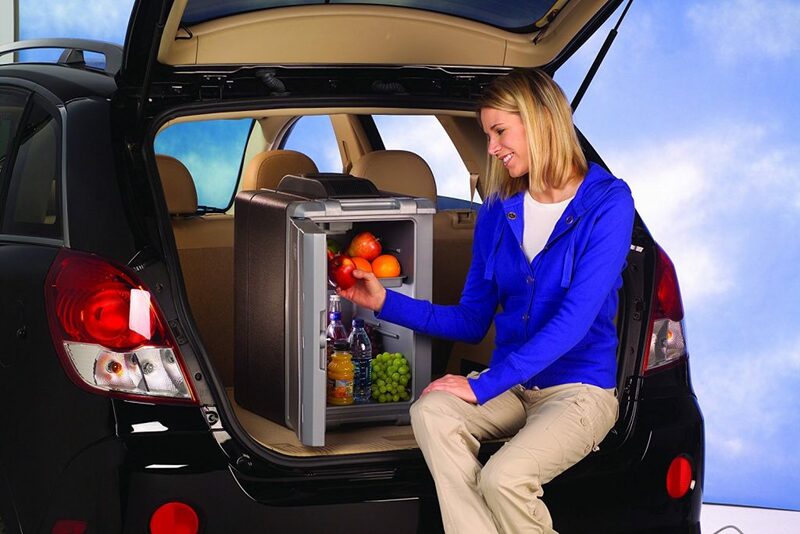 The cooler/warmer fits perfectly behind seats and is easy to carry with its folding handle. Wagan also sells an adapter separately if you want to plug the unit into a standard 110-volt wall outlet. 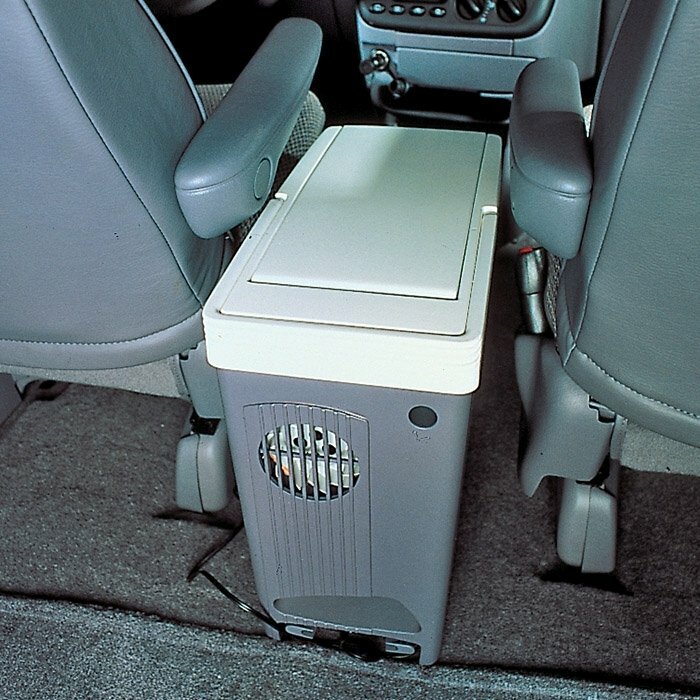 Koolatron’s slim electric cooler fits between seats in most small cars and SUVs. Like the Wagan cooler, it plugs into any 12-volt outlet or standard wall outlet with an adapter (sold separately). The coolers will keep your drinks 40 degrees F cooler than the outside temperature. You can optionally reverse the plug and use the units as warmers to heat food up to 130 degrees F.
The popular Igloo brand’s Iceless Thermoelectric Cooler is both lightweight and portable. It comes with an 8-foot long cord that plugs into any vehicle’s cigarette lighter. They’re designed with a quiet fan to keep beverages chilled and a carrying handle that swings up. 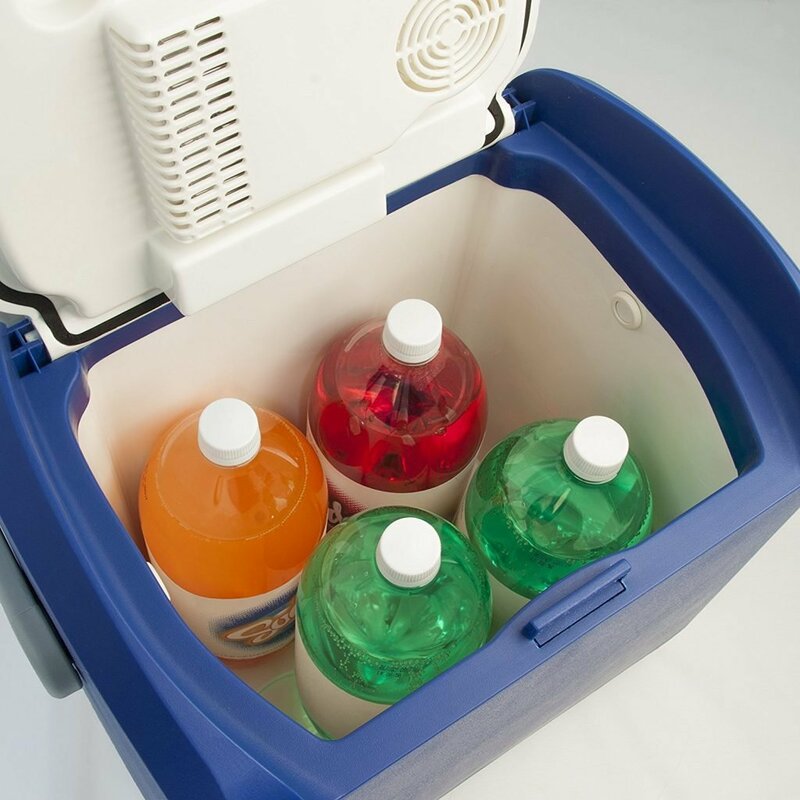 The coolers are available in either 26-quart or 28-quart. Black & Decker’s Cooler and Warmer has a more unique design than other iceless coolers. This portable cooler/warmer sports two cup holders, room for 12 cans, and a zippered side pouch. You can plug the unit into your 12-volt outlet and set it upright on your seats, tailgate, or floor. The inside cools down to 40 degrees below the outside temperature or heats food up to 120 degrees F.
They also make a smaller version with enough room for eight cans. What sets eBays Crew Cooler apart from other soft-sided coolers is its simple yet functional design. The bottom cold compartment is insulated on all six sides and the many zippered compartments can be stuffed with other items. They’re offered in a variety of colors—you can get the cooler bag in Pitch Black, Sinful Red, Brushed Indigo, Blue Yonder, Eggplant, or Grey Matter for $55 on Amazon. They also make a smaller Junior version for $35. The Tundra cooler is much larger than the Roadie (listed above) but like all YETI products, it is built to last. Their Tundra is made in a range of sizes from 35-quart (holding about 20 cans) up to 75-quart and 105-quart, and comes in White, Ice Blue, and Desert Tan. YETI’s durable rotomolded construction and heavy-duty rubber lid hatches make the cooler not only last longer but also bear-resistant. Ice also stays frozen for two or three times as long in these large YETI coolers than many other brands. 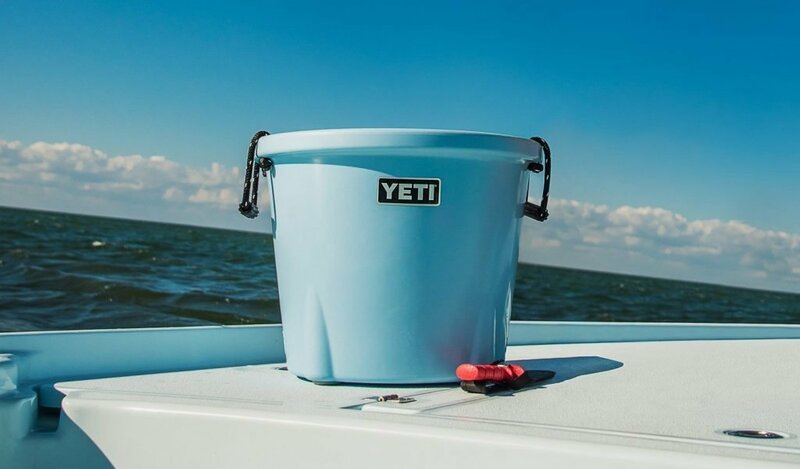 You can fill any bucket with ice and fill it with drinks, however, YETI’s Bucket Cooler will keep that ice frozen for a much longer trip. Pelican’s heavy-duty coolers are similar to YETI’s Tundra line, but with more features like a leakproof plug to drain the melted ice and their own built-in bottle opener. They’re made with two inches of insulation and a freezer-grade seal to keep your ice from melting for up to ten days. 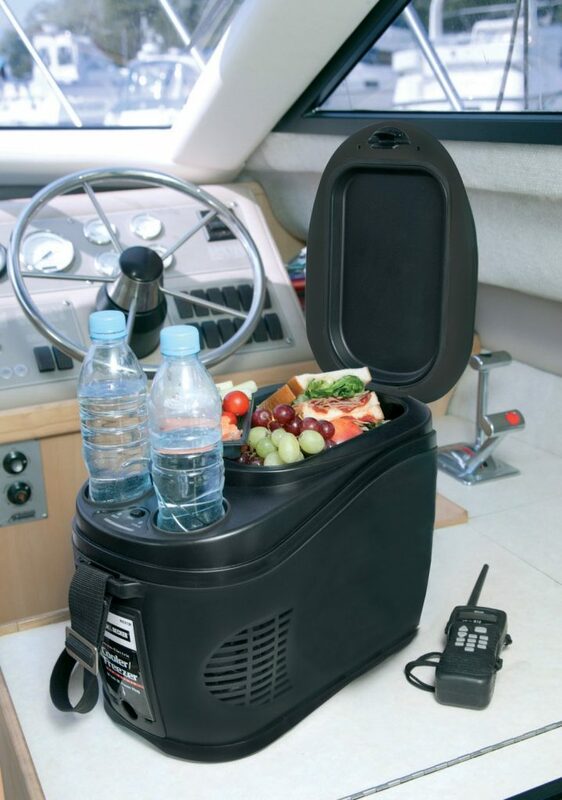 The coolers also have locking hatches, tie-down slots, and four cup holders on the top. 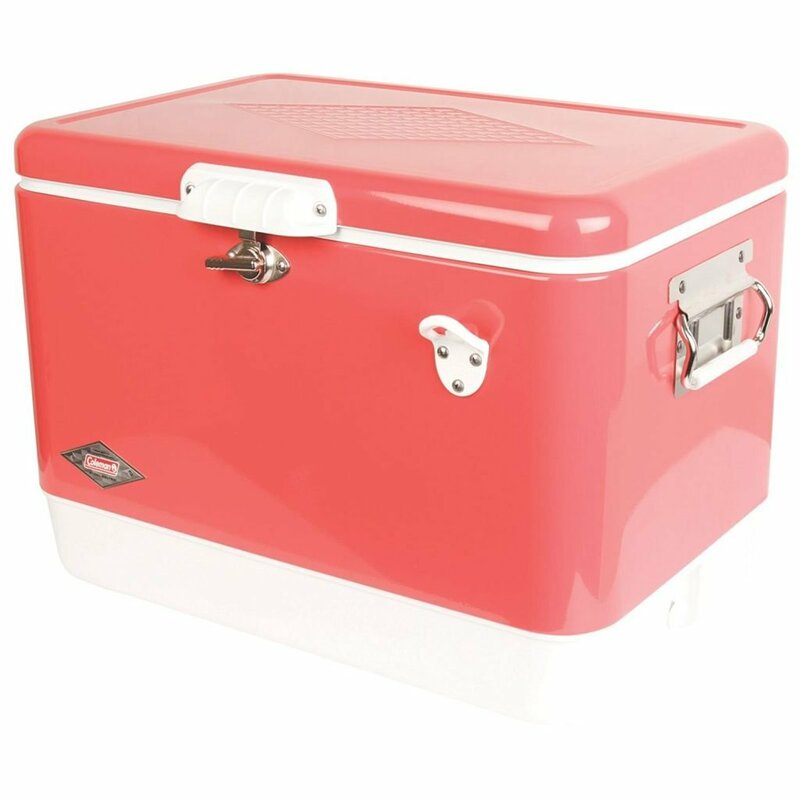 You can find the coolers in a range of sizes from 30-quart ($225) to 70-quart ($350) and in several color combinations including White/Gray, Seafoam Blue, Gray/Green, Tan/Orange, Brown/Tan and more. 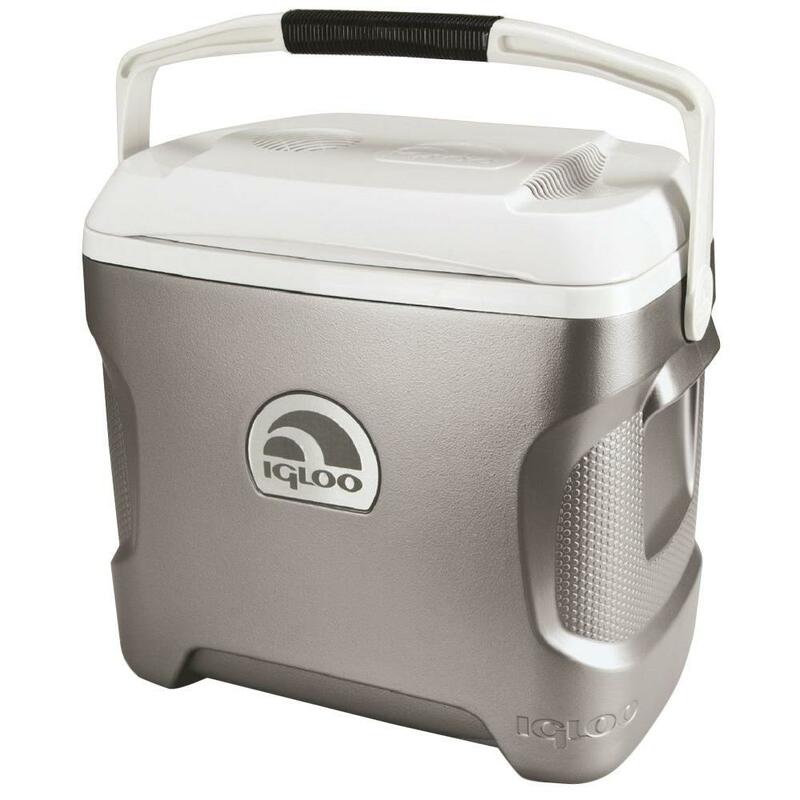 Much like Igloo’s portable Thermoelectric Cooler listed above, their 40-quart cooler will chill your food and drinks without ice—but on a much larger scale. Yeti just disassociated themselves from the NRA. Maybe you like that, maybe you don’t. Coleman has always been a good choice. I’m with you. I will never buy a Yeti after their decision. You left out the Wal-Mart copy of the Yeti cooler. 1\3 the price and just as good. Just didn’t have the trendy, “Yeti” name. Hey, if you have to pay an extra $200 just to have that logo, by all means, go ahead. I’m good without it. LOL @ all the Yeti haters! All it means to me when someone bashes Yeti over the price is that they don’t have one. 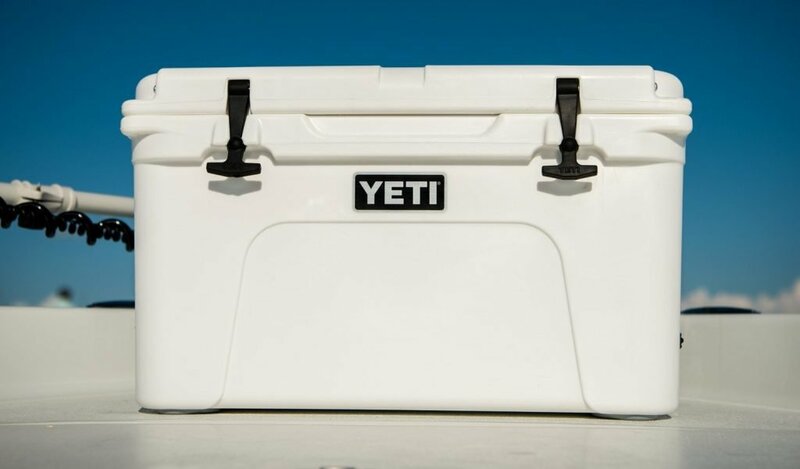 Yeti invented the Polyurethane insulated cooler & tried to patent it, but the patent office said coolers were already invented & they couldn’t patent it. So all these other companies copy-cat them. With Wal-Mart copying them exactly, every crease, fold, dimensions, etc. & are now getting sued for it. Let’s face it, you either have a Yeti or you have a knock-off. Myself, I don’t support knock-off companies. But please spend your money where you like; maybe you can pick up a knockoff Rolex & a fake Michael Kors purse for the wife. Anyone of these coolers except Yeti! Yeti has positioned themselves as anri-2nd amendment proponents. I don’t support those companies that are against a free society. Those companies that wish to help dismantle the US constitution. Plus they are for yuppie types, trend followers, and people that are all about labels. There are plenty other coolers out there that are proud to be American . Preach it, Brother! @Paul can have his ostentation and his allegiance to a “copy-cat.” Foam coolers have been around decades before Yeti. You can still buy simple foam “ice chests” for about $5 (less than the tax on a Yeti). It is true they don’t have the designer look or the shoulder strap. However, if you put a small piece of dry ice in one, it will outlast a Yeti any day. No company that uses their name and popularity to make political statements will get my business. Count me among the anti-Yeti. I’ve had a midsize Pelican cooler for three years and it does the job. Built to last and last it does. First saw them at the NRA convention in Louisville.